"Between 1-7am, 400 police blocked all roads in and out of the town, whilst the contractors moved in to remove uprooted olive trees. Those that resisted were attacked by the police, including the Vice-mayor of the town, and witnesses say that they have never seen the police so aggressive". Italian police have begun to video and photograph participants in the protests and blockades, some of whom have been fined from €2,500 to 10,000. Italian journalists continue to face frequent threats and other serious impediments to their work, according to Ossigeno per L'informazione (OSSIGENO), a collective effort by journalists and non-governmental organisations to track threats to media freedom in Italy. 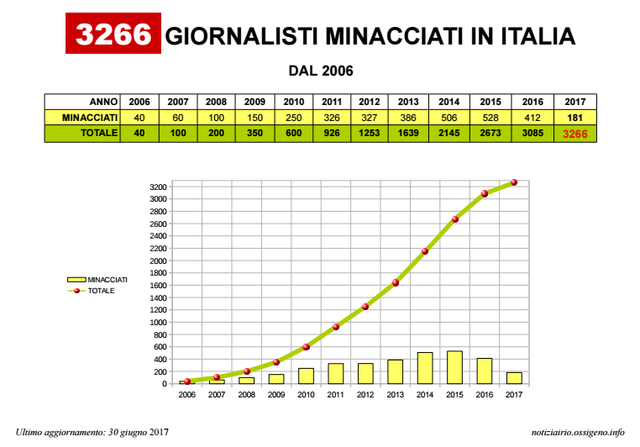 As of 24th June 2017, OSSIGENO had recorded 3,266 individual threats against journalists since 2006. The number of threats peaked in 2015, when 526 individual cases were recorded; there were 412 cases documented in 2016 and 181 in the first six months of 2017. Frivolous defamation lawsuits are the most common tactic used to target journalists, as well as other abuses of the legal process. Personal insults, warnings and physical attacks were also commonly-used to intimidate journalists. According to OSSIGENO, print journalists have been the most likely to become victims of such attacks. In April 2017, respect for freedom of information received a boost, at least on paper, when Italy's Council of Ministers approved a new Transparency Decree, which partially widened citizens' right to access information held by public authorities and which introduced a number of requirements for publishing information on public websites. Freedom of information activists in Italy, however, continue to call for the proper implementation of "universal access" to allow anyone to request information. Despite the introduction of a comprehensive law in this area in 2016, an April 2017 report by Italian civil society organisation, Diritto de Sapere, entitled "Ignorance of State" highlights the poor level of implementation of Italy's access to information provisions in practice. The report, based on an analysis of 800 requests for information, found that seven in ten requests were ignored, and when responses were received by applicants, over a third were denied without a clear justification. In April 2017, the Italian Coalition for Civil Liberties and Rights (CILD), Privacy International and the Hermes Center wrote a letter to the Ministry of Economic Development seeking information about exports of surveillance technologies by Italian companies to other countries. In the letter, they urgently requested the publication of detailed information on these technologies after Al-Jazeera had aired a documentary showing Italian and international companies offering the possibility of exporting surveillance equipment to authoritarian countries – including Iran and South Sudan – which regularly violate their citizens' fundamental rights.